The Media Source, Inc. is a recognized Media Buying Service providing a variety of services dependent on the needs of their clients. As corporations start marketing smarter, it is apparent that the full service advertising agencies will need to concentrate their services on "mega" corporations. Many medium and large corporations have found that combining the expertise of two or more sources can be a cost-effective approach to achieving successful results. Anticipating these marketing shifts, The Media Source, Inc. was formed. The Media Source, Inc. provides marketing strategies and writes marketing plans for their clients that enhance and aid the achievement of the overall growth plan. 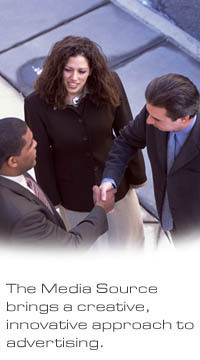 Once approved, The Media Source Inc. implements the plan, negotiates the lowest cost per point available without sacrificing the strategy and weight of the campaign, issues the buy orders, coordinates the delivery of the creative material, and checks all invoices and affidavits to make sure they agree with times specified before billing. All media buys are monitored constantly to ensure that the post-buy analysis is a formality and written proof of performance. Look into our services, check out our portfolio, and let us show you how you can achieve your advertising goals! We do not actually think about it, but television commands more recall because it commands the use of two senses: sight and sound. as the clients we represent... and our clients are the BEST!